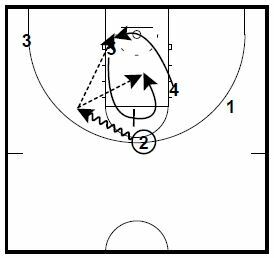 These plays with 2 options to finish are taken from the Basketball HoopScoop’s Fred Hoiberg Iowa State Cyclones Playbook (written by Wes Kosel). We are running our March Madness Celebration eBook bundle sale again this year. Any bundle of 4 Coaching Toolbox & HoopScoop eBooks is $35. Or. Create your own bundle by selecting any 4 of these eBooks and emailing me at [email protected] or call/text me at 765-366-9673. 2 screens up for 4 who cuts down the lane line to the basket. If 4 isn’t open, 2 pops out and gets the pass from 1. 5 sets a ball-screen for 2 as he catches the pass from 1. 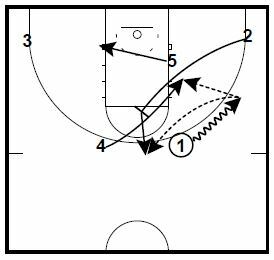 3 moves in from the corner to set a screen for 4. 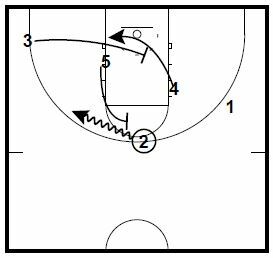 2 looks to pass to 4 inside for the score. If 4 isn’t open, 5 screens down for 3 who cuts to the top of the key for a shot. After screening for 4, 2 pops out. 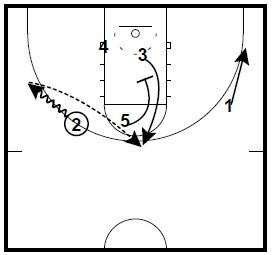 1 looks to pass to 4 or pass to 2 up top. Once 2 has the ball, 5 sets a ball-screen for 2. 4 slides across the lane as 5 rolls behind him. 2 looks to pass inside to 4 or hit 5 on the roll.